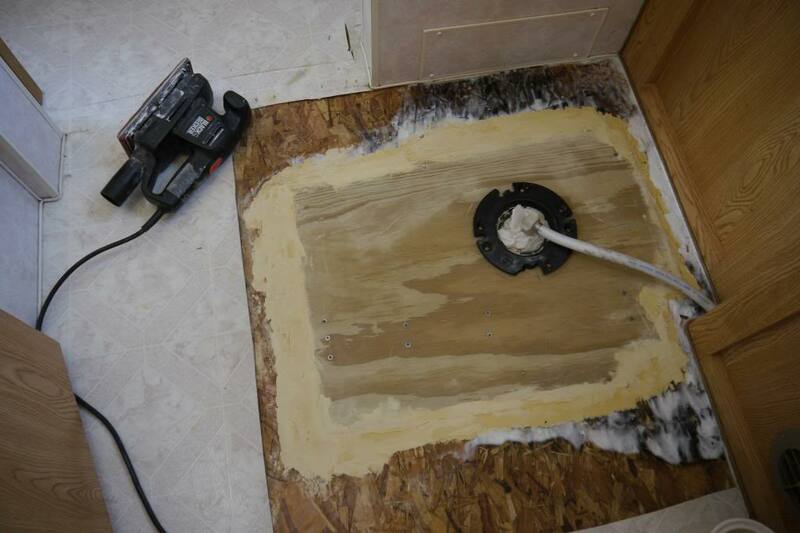 OK, so just for the heck of it, here are some pictures of the bathroom floor repair in our new-used T-2753. Comments will refer to the pictures below text. 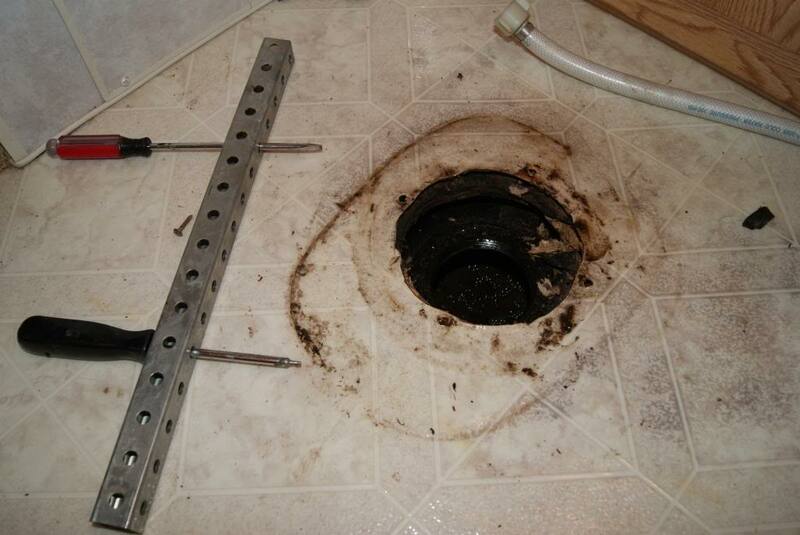 The toilet was apparently leaking but it appeared the damage was still localized to the base of the toilet. Due to the nature of the repair, one or two pics may contain unapealing images. 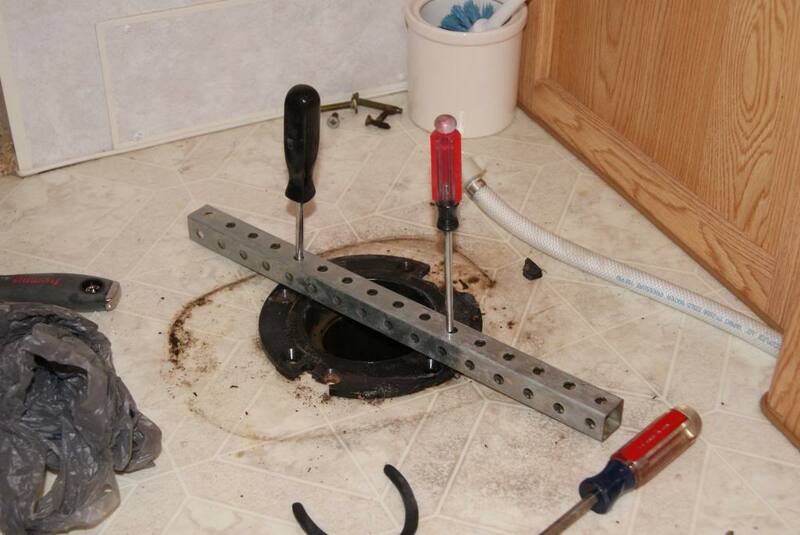 Removed the toilet and the flange is in bad shape, one screw hole broke off with very little pressure. After removing the screws, the flange did ot want to come off. After a little research, it turns out it is screwed in to the black tank. Good thing I didn't try too hard to muscle it out. After being in place for years, the flange just was not turning by hand. Luckly, I had some scraps from previous projects around and fashioned an aparatus to give me some more torque. The screwdrivers fit intot he two notches on the flange. Using this "Tool", the flange turned easily and came right off. The wood around the flange is obviously wasted. It looks like the black tank was holding up the toilet by itself. 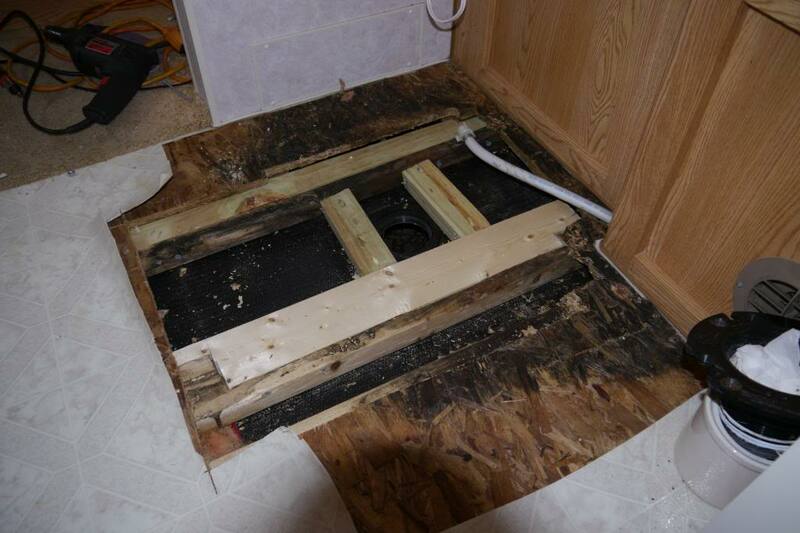 Although the particle board under the cabinet is solid, it has rot. I don't think it shows in this angle but the wood on the joist is dry just under the cabinet... thank goodness. Here is all the excavation for tonight. You can see that there is a large beam to the right and a small beam to the left. The plan will be to sandwich the bad length of the left board between two new peices of good treated wood. I will probably cut out the rotted part of the right board and screw in replacement wood. I will have to inject Glycol into the OSB with rot and hope it penetrates under the cabinet far enough. Right now it's sitting under a fan while I try to find a place to buy syringes. Good work and thanks for taking the time to post pics. These pict-o-grams really help. 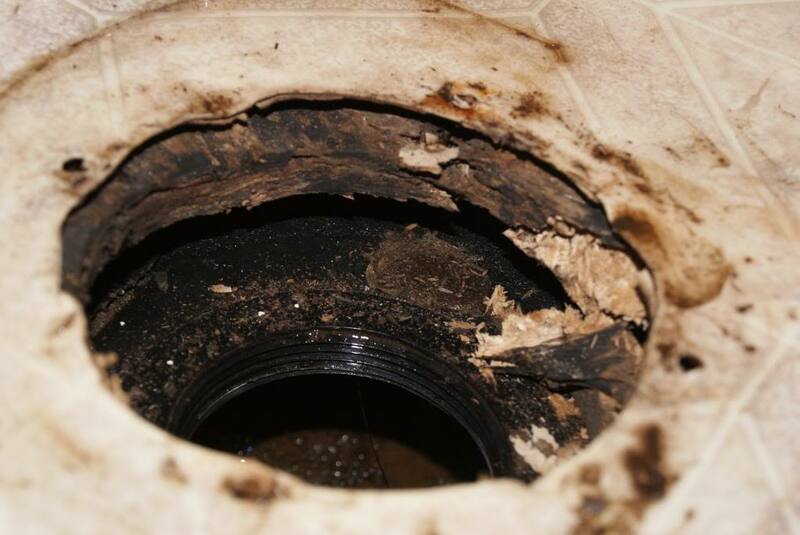 Once your done I am going to link your post and EMD_Drivers floor to the FAQ section with the other wood rot fit it posts. I never knew the toilet flange screwed to the tank. Good info. Excellent pictures. I hope I am never faced with that problem but it does add to the storehouse of knowledge. Some of your pictures look amazingly familiar! Looks like you have the job well in-hand! That tool you made is quite clever! 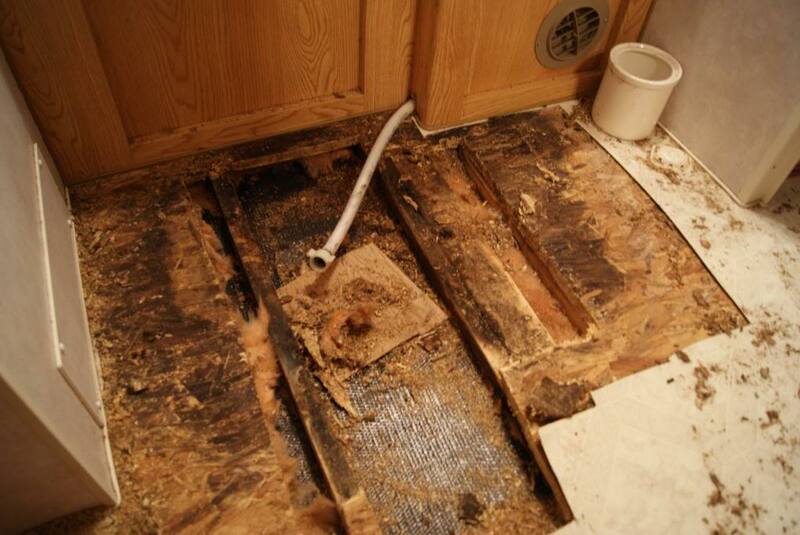 At least your water damage is all localized to the bathroom area. 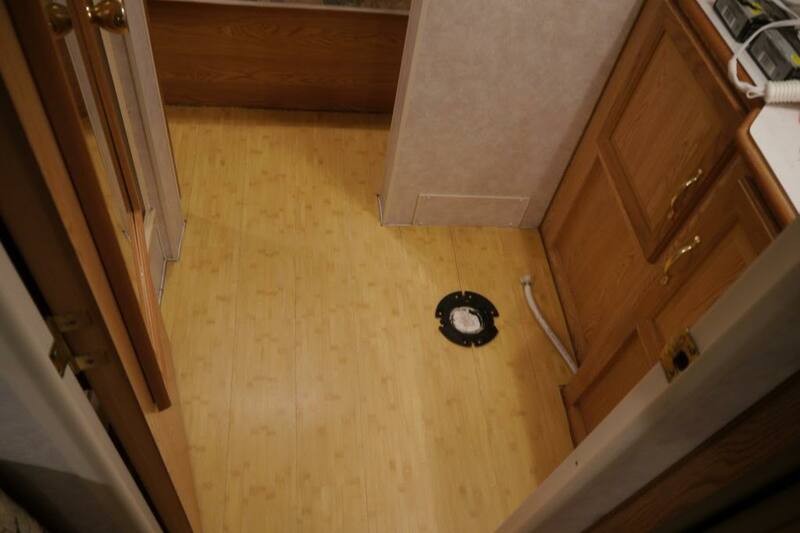 Hopefully you can just seam the flooring to isolate the bathroom and only have to replace in the bathroom. I had to replace the stand pipe in a previous Sunline because it broke. It's not a fun area to work around! Well, nothing exciting or picture worthy. I Applied Glycol untill it seemed to stop soaking in. It took alot! Now I have to let it dry for a long time. I figure at least a week. I will post more pics when I start actuall work on it. It looks like one part of the OSB is turning back to brown but that could be my imagination. It was 3-4 days, before I started noticing a difference... I did not spray any OSB though... 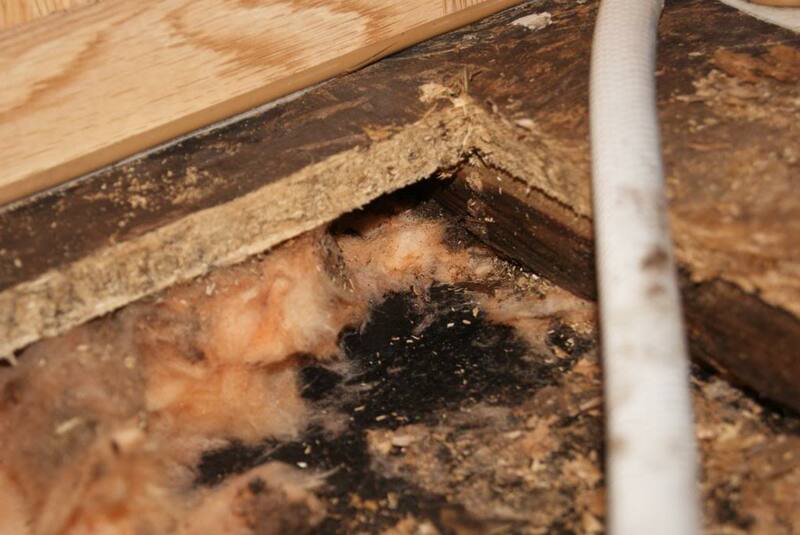 I removed all the OSB, that had rot/mold in it.. Too much of a health hazard for Kitty. Anyway, I resealed half the roof so far and got the leaks. I'm not documenting the repair of the rear because it makes me sick to my stomach and is somewhat overwhelming. I'm not going to be able to do as thorough of a repair as I would like due to financial issues that have hit us and not having a barn to keep it in while ripping the sidding of. I did however have some time to get back to the bathroom floor which has finally dried all the way out. I had to cut away more of the wood from the 2x4 support than I originally thought. There was alot more damage under the wood where the water had just sat with no where to go. I notched out the bad parts and had just about 1" of good wood left along a section. I got some good wood and sistered the small support on one side of the toilet and notched and sistered what was left of the large 2x4 support on the other. There are large carriage bolts connecting the 2x4 and new wood. 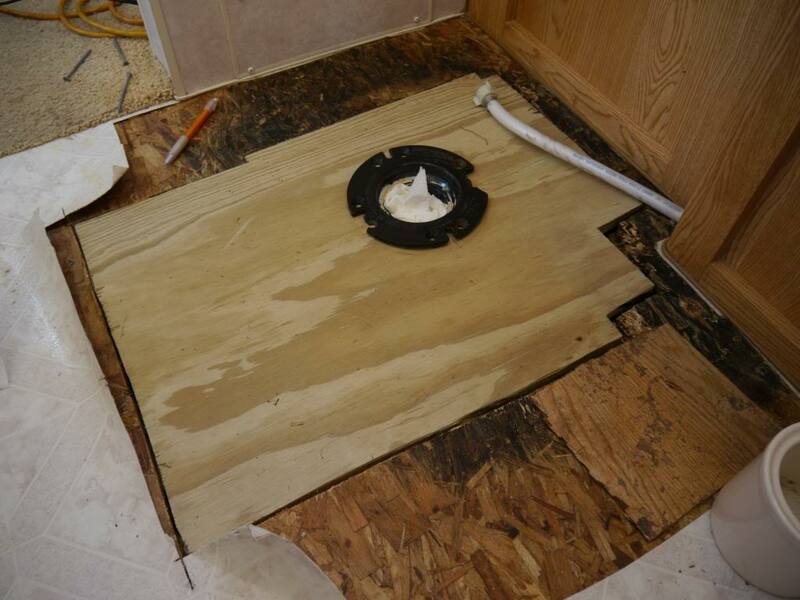 From the factory, the toilet is supported by the flange and OSB. While that is probably more than enough, I put some small sections of 2x3 on either side to give a little extra support and wood for the flange bolts to dig into since I was already in there. Then I measured out my irregular hole in the OSB and went to work on cutting a peice of plywood to fit. I got it very close but for some reason messed up on 2 measurements. I will have to cut some small plugs then use wood filler all around and sand. 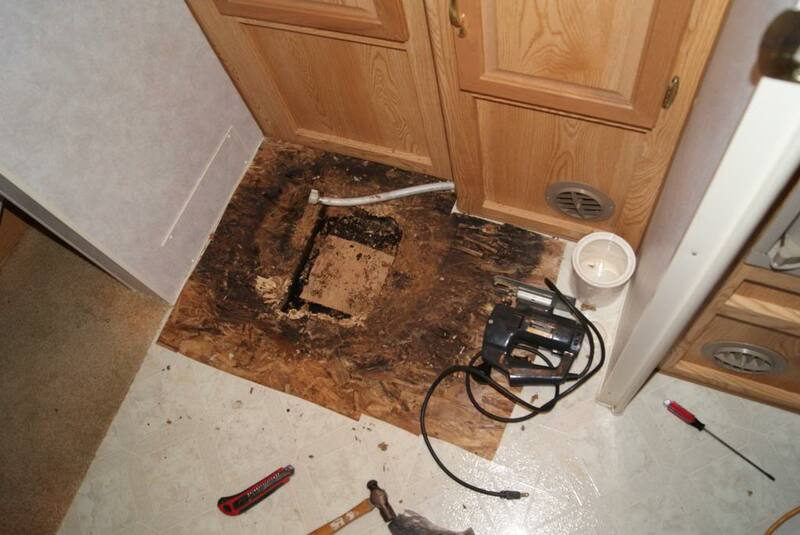 The new plywood sits flush with the old OSB in some areas but is almost 1/8" higher in front of the toilet. All I can think to do is sand down the plywood some and then use wood filler to ease the transition. 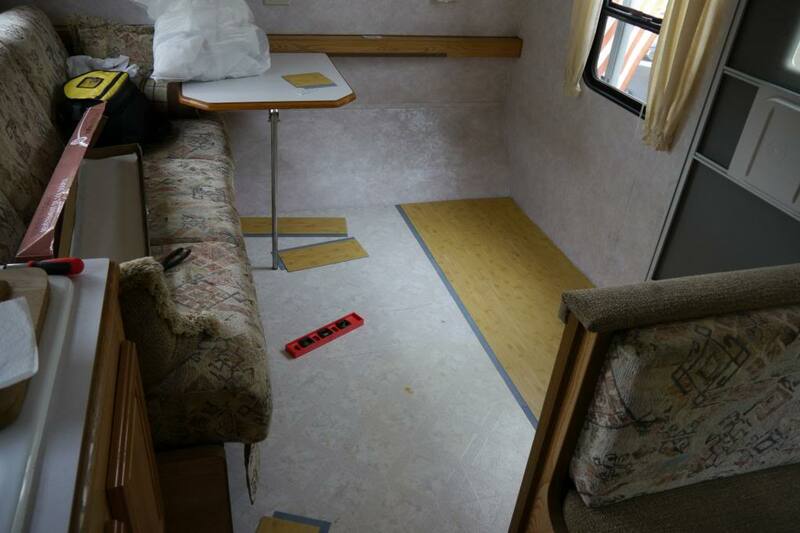 The new flooring has already come in and is waiting in the garage so next job is to take up the carpeting which I know is going to be a pain from removing it out of the storage comaprtment under the bed. Then the alure vinal flooring goes in and it should look great on the inside while I wait for the rear to dry out. Sorry to hear things are worse than expected. 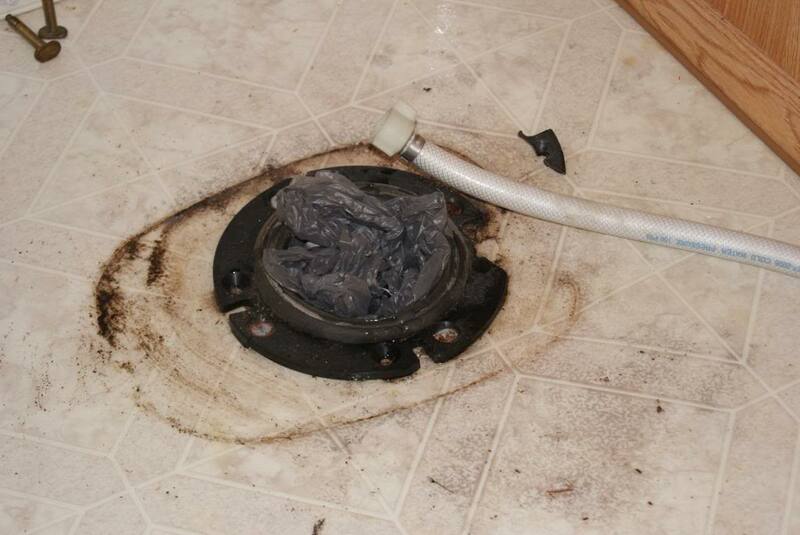 Unfortunately, that's how water damage always seems to work. It starts leaking and before you know it, it's out of control. 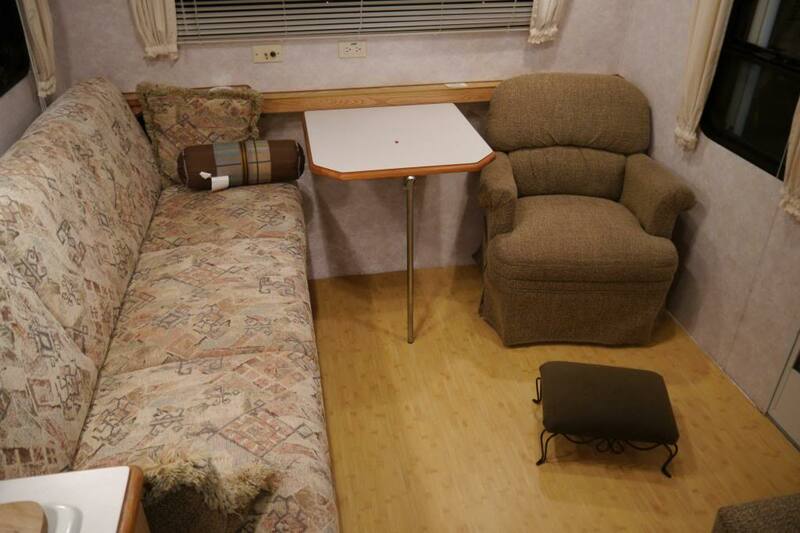 Hopefully you can get the repair completed soon so you can enjoy your trailer! Chances are, the guy just didn't do an inspection on it, or he just isn't very experienced. 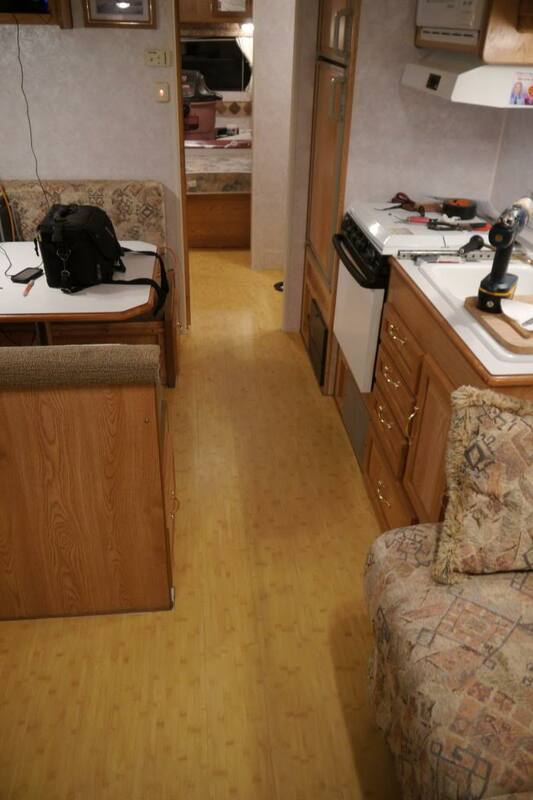 Since the trailer sat outside in Florida since new, I'm not surprised that it leaks if the previous owners just walked away and didn't do maintenance. They oughta put the guy that invented particle board in prison...seriously horrible stuff. Thanks for sharing OhhhWell..don't get mad...get hammerin' and when your through, go down to the guy who sold you this camper, park your camper outside his place and tape up these photos and any you take of the bedroom repair on the the side facing the highway along with a quote (IN BIG LETTERS) " "Name of the the guy who sold you this trailer) told me that it was in good shape...see photos." 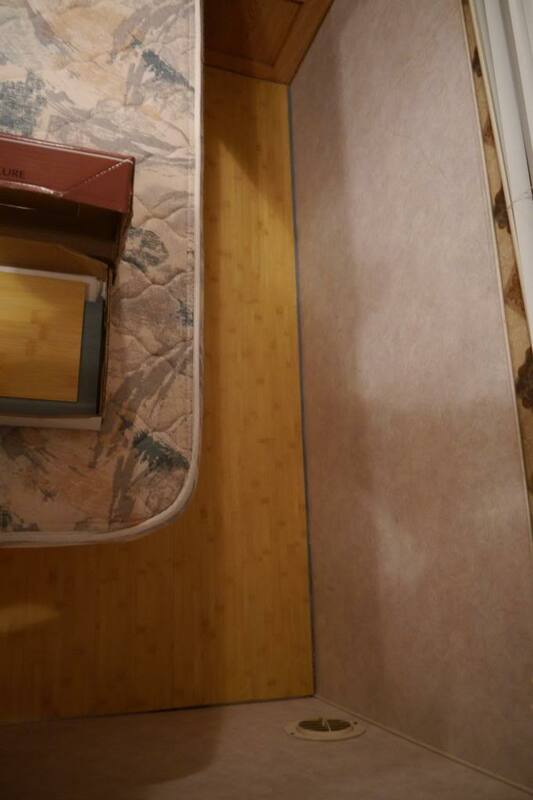 I'd like to see photos of the finished bedroom area when you find the time to "get 'er done.' Hope things are looking better for you financially. 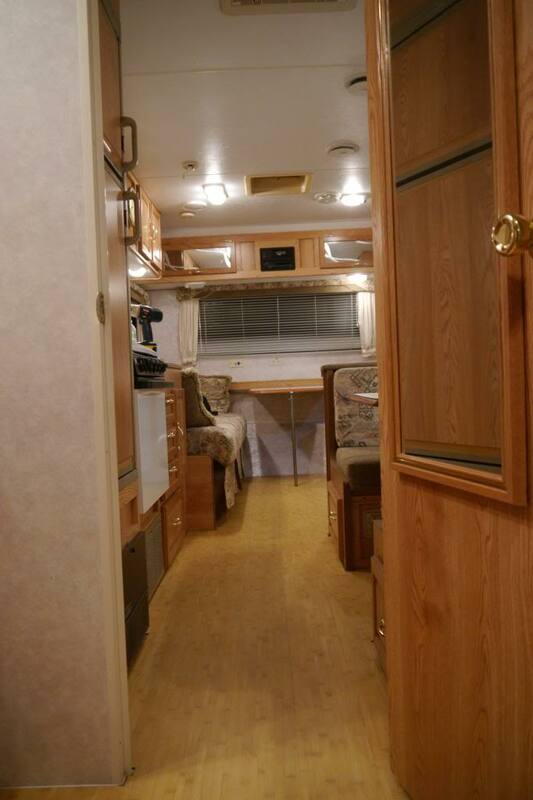 Well, the guy runs an RV repair business and specifically told me the roof seals were all great when I asked him. When I looked myself after all this damage, that sure wasn't the case. Only some of the screws over the front cap had ever been resealed. Drake, yes... something like that is very tempting. Anyway, the interior is 90% done! All that is left is trim. Post with pictures to follow. Almost done with the interior! Here is the toilet subfloor with wood filler around and sanded down so the height difference between the plywood and OSB is at least somewhat eased. The white stuff is some cheap elmers wood rot stabilizer. It is garbage but does help with the lightly damaged OSB and createds a nice seal at the cabinet. I put some cheap vinal squares down to match the height of the linoleum. 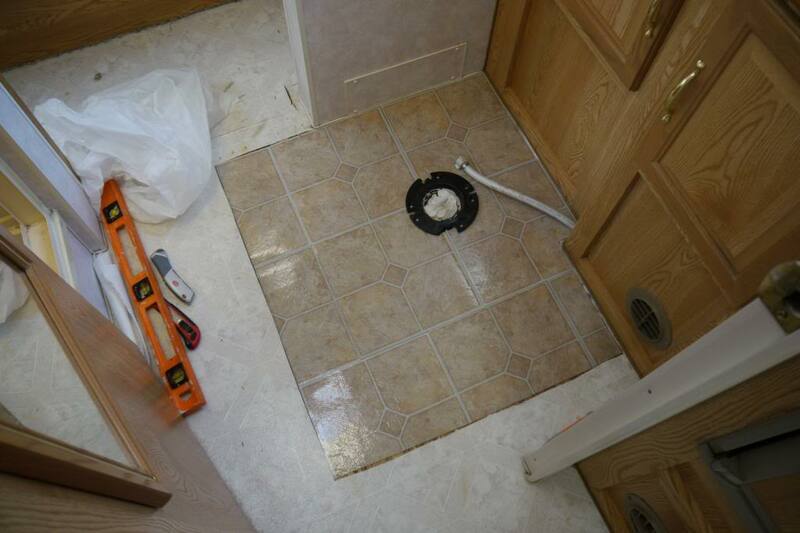 The linoleum only went a few feet back in the bedroom under the carpet so, more squares. 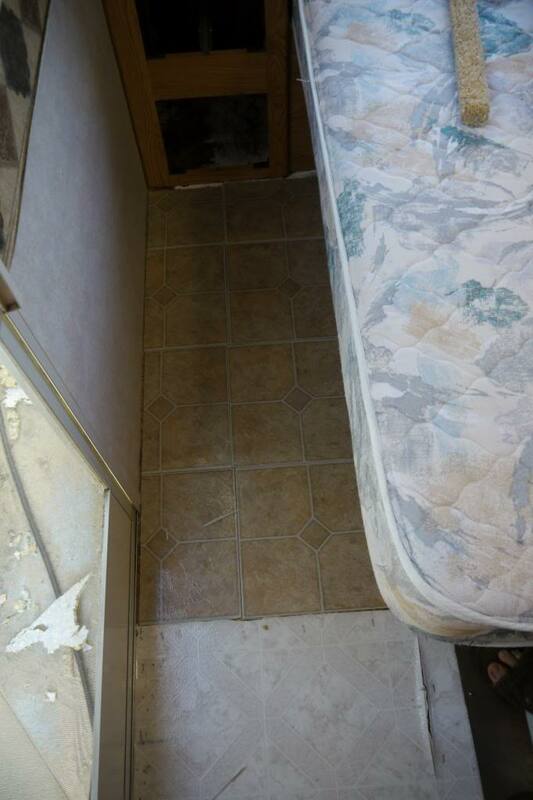 As a side note, I need to express my anger at whoever installed the carpet in the bedroom on this trailer. The carpet everywhere used too many darn staples but the carpet on the street side of the bedroom was absolute insanity. There were actually clusters of 4 staples every half inch. Moving on... Luckly, the linoleum goes all the way to the front under the carpet and the carpeted front trim / Table rest came off easy. Here is some of the new flooring going in. We went with Alure Vinal planks in the light bambo patern. Even though I liked the wood pattern perpendicular to the sides like EMD Driver did, I went with parallel for ease of install. That being said, I think I did more cuts and measuring than when I did my whole house in laminate. 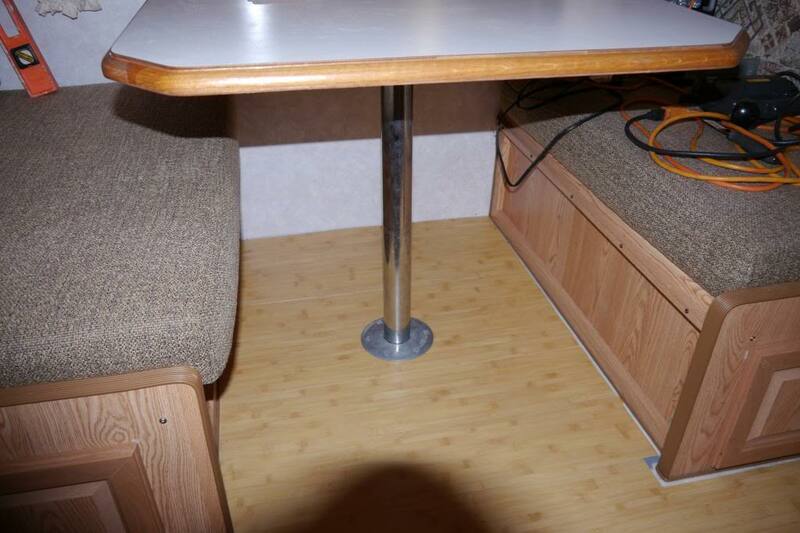 Here are a few pics of the flooring in. Next weekend will be trim and quarter-round.